So on the job front, I have some potentially exciting news. 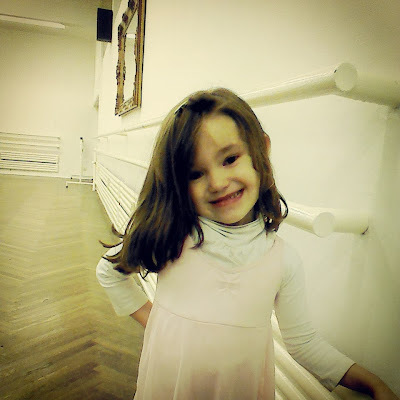 I had an interview last Thursday at a small bilingual preschool (Spanish/English). It went REALLY well. The owner seemed to like me a lot, and she was speaking throughout the interview to me as if I had the job. I had a great feeling about it upon walking out. After pacing nervously for 3 days and basically being able to think of nothing else, I gave them a call. I was told by one of the girls who works there that the owner would like me to come in on Monday, November 25 at 8:30am to spend 1-2 hours with her and the kids. Assuming it goes well, she will draw up a contract for me and sign my paperwork!!!!! I am beyond excited, and also nervous. Monday is a hugely important day for me. As I will be just a few days shy of when my visa is set to expire, Monday needs to go well :-D Wish me luck! In other exciting news, I had another interview at a fancy, much larger children's school two days ago. That also went quite well. The two girls who interviewed me were about my age and we chatted and laughed together. Lots of fun. At the end of the interview, they invited me for a second interview on Wednesday, November 27 of next week from 9am-3pm to spend the day with the children, and assuming that goes well, I would be offered that job! And finally, I have one more interview next week as well at another school! So right now, I am feeling good. I am a tad superstitious so a bit hesitant to write this before I have been offered any job officially...but things are looking up! I am feeling optimistic and excited. Yesterday morning (Thursday), I was doing some Just Dance via YouTube for fun and as a workout (Mom, check out this dance!!! I found this one and knew right away you would love it: https://www.youtube.com/watch?v=0XvdMJ-KIZY It's insane. But SO much fun!!). Anyway I had just woken up, was sweaty, un-showered and in a silly outfit when there was a knock on the bedroom door. I was greeted by an incredibly sweet, smiling boy holding flowers and Beninstich cake (my favorite German dessert) for me!!! That made my day. The homes on the street where I work...very Beacon Hill esque. The actual apartment building I work in. Alright, that is all for now, folks. I will check back within the next day or two!! I miss all of you, a lot <3 I think of you all very often. Activities included: baking pumpkin bread, baking ricotta cookies, cooking ravioli with homemade Alfredo sauce, delicious lunch out which consisted of Turkish wraps (though I got mine without meat, so I had a cheese like feta but milder, and lettuce, tomato, onion and a garlic sauce, so good) and relaxing. It was overall a fantastic weekend. Today (Monday) I spent the day in Frankfurt tooling the streets, looking for jobs. I stopped in three kindergartens inquiring about jobs (was nastily turned away from one), walked all over the city (literally 30 minutes from where the commuter rail let me off to the first preschool, walking through the industrial, gray part of the city alone in the cold), and then spent the afternoon with the kids from 3:30pm-7pm (though I had to take the subway , a bus and walk 15 minutes in the dark all one way to pick up Constance at school, and then back home to their apartment with her). Tomorrow (Tuesday), I will apply for as many jobs as possible online, head into Frankfurt for work from 3:30pm-7pm and then attend the English-German conversation group after work which I am really looking forward to as I really enjoyed it last time. Last time there were a number of people whose phone numbers I had wanted to ask for but hadn't gotten the chance, so tomorrow, that is happening! Still no official job offers. I will keep you posted...! Frankfurt living...finally an update after a long silence! I realize its been quite a while, like a couple weeks, since I have written anything at all. I apologize for that. Truth be told, its because I am struggling a bit and have felt a little bit unsure what to write about currently. I generally like to write about excitement, really fantastic things and the wonder of whatever I have been doing as of late over here in Europe. Right now though, while there is still wonder and excitement for sure, I have largely been experiencing some major stress and loneliness for the time being. I have been living in Germany for almost 2 weeks now (well in two days it will be two weeks). 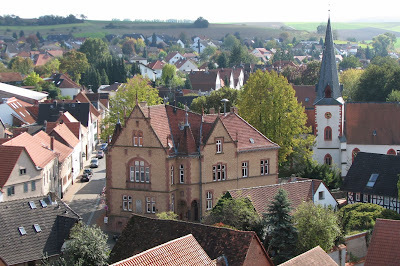 I am living in Reinheim which is a tiny German town, with narrow streets, typical German looking buildings and small country-esque homes, a few little shops here dotting the city center and landscapes of rolling hills, farmland, church steeples off in the distance, the last remnants of fall foliage still dotting the landscape, very pretty. I love the landscape here. A small snapshot of the city I got from Google. I work in Frankfurt which is about a 40 minute drive by car from Reinheim. However by public transportation, its about 2 hours total, one way. I take a bus from where I am living which is around a 45 minute ride. Then I catch a train from Darmstadt (the closest good-sized town, a bustling college town about 20 minutes from Reinheim) into Frankfurt which takes about 20 minutes. And finally, I take the metro 2 stops and walk the remaining 10 minutes to the apartment where I work (babysitting). Going home at night, whenever I leave their apartment depends on when I get home. I generally work from 3:30pm-6:30pm. If I leave right at 6:30pm, I can catch the 7:30pm bus from Darmstadt back to Reinheim (after taking the 20 minute train ride back to Darmstadt from Frankfurt) and am home by 8:15pm. But if the mother comes home late (which is going to be every night next week), then I will not catch the 7:30pm bus. And there is not another bus until 8:30pm. So I will be home around 9:15/9:30pm. This has become a fairly large source of stress for me, it's been tiring and deflating. Last week, my friend's father very kindly took me to the local visa office to apply for my work permit. We found out, much to my dismay, that my babysitting job does not suffice as a legitimate job to use when applying for a visa. One needs a job within a firm somewhere. My heart sank with this news. I have two weeks left until my tourist visa runs out here. So I have been POUNDING the pavement walking into places with my resume (mostly bilingual kindergartens) desperately looking for work. 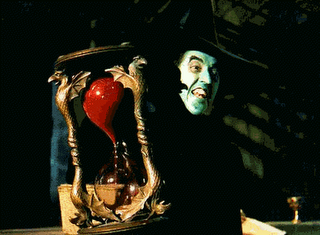 You all are familiar with this scene from the Wizard of Oz, when the wicked witch gives Dorothy her time limit left using this hour glass. This is the image that keeps entering my mind lately. Joking aside, because I admit this picture is laugh-inducing, I have begun to feel stressful vibrations in my stomach daily, a churning and hurried fear, a desperation in me is building. I do not feel ready to go home in just two weeks. Something about it just feels...off and not right. It would feel premature to me, to be heading back already. A slamming shut of a chapter in my life that is not ready to end yet. It would feel like the closing of something that could have been more. So I have been struggling with feeling this mounting panic and a feeling of being very unsettled because I do not know what is going to happen yet. I feel as though I am racing against the clock, I guess because I am. I have applied to many, many jobs. I have also walked into places and handed them my resume. I have had two interviews thus far at bilingual preschools this last week and have another one next week. I am working hard and am not going to give up until the very last day. So please, keep your fingers crossed for me everyone! I need to land a job so I can get that visa and stay here for a while longer!!!! That aside, some details about my current (and hopefully only temporary) job. I am working Monday through Friday, in Frankfurt doing babysitting for a French family (they are from Paris). I like them very much. The parents are Jack and Caroline, the three children whom I babysit are Gabriel (age 11), Theodore (age 8) and Constance (age 5). They are all very sweet. Gabriel is quiet, intelligent, introspective and sweet. He is a joy to talk to and be around. He is soft spoken and friendly but also likes to keep to himself sometimes and do his own thing. Theodore reminds me a bit of a tornado or the Tasmanian devil. On the one hand, he is incredibly intelligent (always reciting interesting animal facts to me, almost none of which I knew! For example, did you know the smallest bird in the world is the Bee Hummingbird? And that it fits on the head of an eraser?? ), but on the other hand, he has struggled emotionally because his family moves around a lot for the parents careers (they have lived in Paris, Boston and now Frankfurt within the past 6 years ish I believe), so he is quick to anger and lose his temper, breaking down and crying over little things. He is sensitive and sweet though. Constance is adorable. SO cute, she looks like a little doll. She is polite, gentle and giggly. She LOVES to help me cook dinner in the evenings, rushing to my side excitedly and pushing up a step stool to help me by the stove. Its incredibly endearing. I greet them as they arrive home after school and sit with them at the table as they enjoy a snack. Then we generally either watch a movie, maybe play some Uno together or another game, I might read to Constance, something like this. Around 5:30pm I begin making them dinner, with Constance assisting by my side. Then I sit with them while they eat (I sometimes eat with them too), then clean up dinner, and generally head out soon thereafter. It's an enjoyable job for now, and for what I am doing, it pays well. But it is not sustainable in terms of the stress and time the commute gives me for the long term. And it will not allow me to get a visa. So I need something else STAT. But for the time being it suffices. 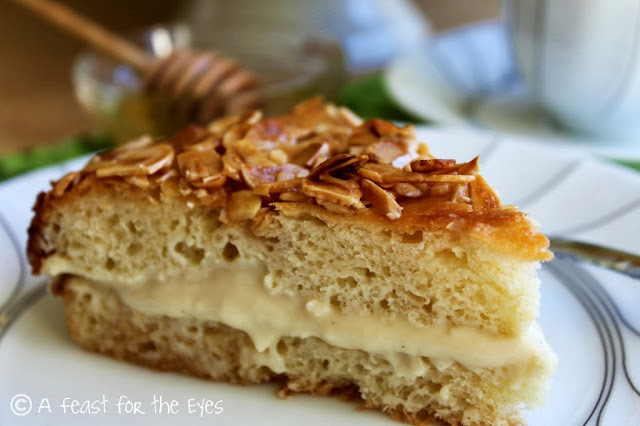 In good news, I have been enjoying more delicious sweets over here! This doughnut was DELICIOUS! So light, moist and cake-like. I guess that is all for the news right now. I will post again soon (I want to get back into posting again regularly, as I love to write and it gives me something else that is fun to do and I can look forward to) especially regarding what is happening with the job situation. Inspired by Goethe’s Faust, Mephisto claims to be devilishly good. Located in a creepy looking cellar, it has a labyrinthine seating area with high-backed red booths, sunken and raised (making it quite difficult to find the toilet or your friends), and candles lighting its brick red walls. The atmosphere is unpretentious and relaxed, and they make great sandwiches and snacks to accompany the more than 25 beers on offer. And right now I am reading a book that I am really loving. I recommend it to my chick-lit loving friends (especially Alex and Sarah ;-)). 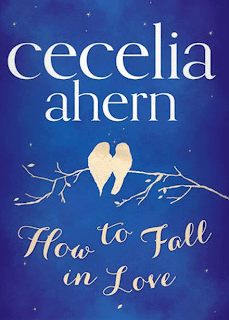 The book is called How to Fall in Love by Cecelia Ahern (the author of PS. I Love You). She has just two weeks. 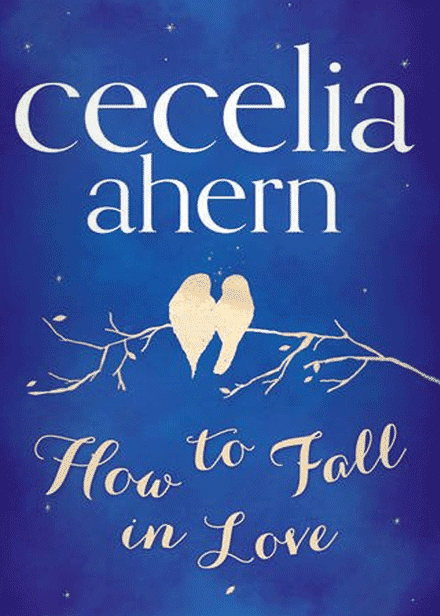 Two weeks to teach him how to fall in love – with his own life. Adam Basil and Christine Rose are thrown together late one night, when Christine is crossing the Ha'penny Bridge in Dublin. Adam is there, poised, threatening to jump. Adam is desperate – but Christine makes a crazy deal with him. His 35th birthday is looming and she bets him that before then she can show him life is worth living . Despite her determination, Christine knows what a dangerous promise she's made. Against the ticking of the clock, the two of them embark on wild escapades, grand romantic gestures and some unlikely late-night outings. Slowly, Christine thinks Adam is starting to fall back in love with his life. But is that all that's happening… ? And in final other news...in terms of how I am doing. Overall I am doing well. I am trying to find some new friends here (I have a few potentially friendships in the very initial stages beginning to form). I am enjoying exploring Frankfurt each day, its a really neat city, like Chicago, with some Boston elements mixed in, but also European. I had tea today with a wonderful, witty, candid and fun older British woman (she is 64!) who I met by mistake last week when I attempted to attend a German/English conversation group meeting that I had found online but sat down at the wrong table in the restaurant (unbeknownst to me in the moment) and instead found myself sitting with all people over 65! However I really liked her, so I asked for her contact information before departing to the correct table after figuring out the mix-up!